Launched on 10 May 1940 to repel the rapid German advance, the Battle of France finished in chaos and capitulation. Despite the heroic acts of the French soldiers such as the cadets of Saumur on that day, 19 June 1940, defeat was bitter. The death toll was over 100,000, and thousands of civilians fled on the roads in a frantic exodus. Recently appointed President of the Council, Marshall Pétain petitioned the Germans for a cessation of fighting on 17 June 1940. From 19 June, German troops entered Lyon and began an organised plunder of the city. 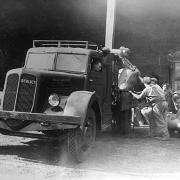 They occupied the Berliet works to repair their equipment and made an inventory of all materiel and rolling stocks. 17 days later, they left the city, taking with them all the Berliet vehicles from Vénissieux and an impressive booty of 25,000 tonnes of food, fuel, metallurgical products etc. DVD : May 1940, 30 days of disaster, édition Montparnasse.